Home > Eating, New York City, North America	> NYC: Blanca (Oct. 2012): Dinner with Mario! NYC: Blanca (Oct. 2012): Dinner with Mario! 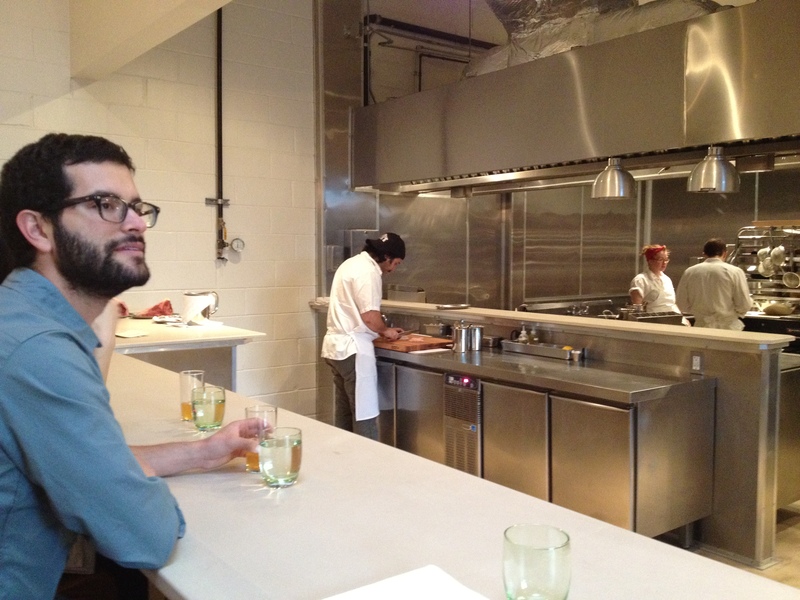 -This restaurant has a similar format to Brooklyn Fare. 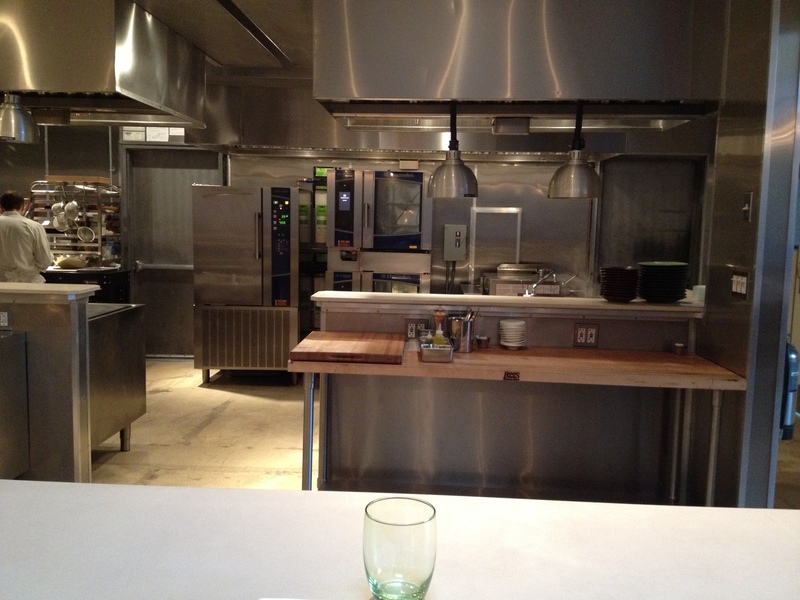 It’s a chef’s-table-style restaurant that seats 12 a night. There’s only one seating time per night, and it’s at 6:00 p.m. To get reservations for any day within a certain month, you have to call on the first day of that month, starting at 10 a.m. You can ask to be put on a waitlist, and they will email you occasionally if they have openings. We got our reservations when a friend replied within four minutes of their email! 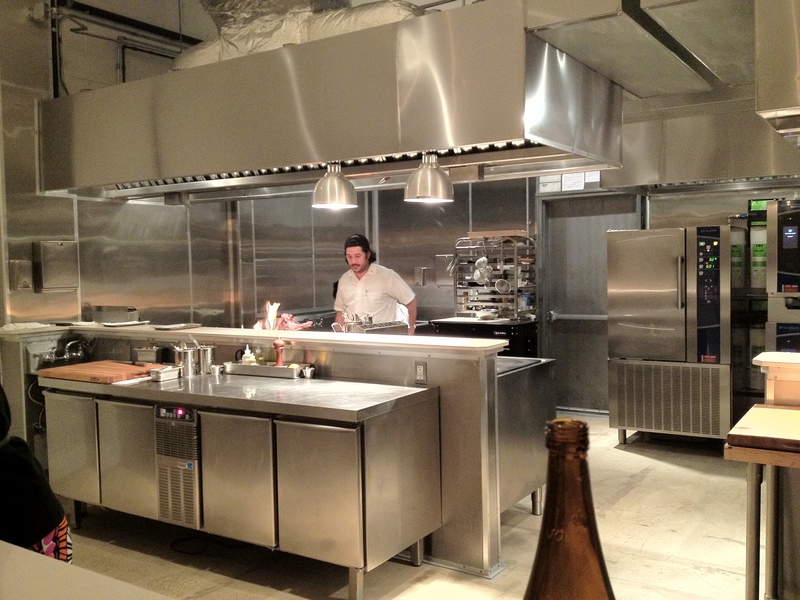 -Tad and I kept on talking about how Chef Mirarchi reminded us of Mario hahaha. I still think he really, really looks like him. -The restaurant is named after the chef’s mother apparently. A fitting enough tribute, I suppose, although a bit too much in my opinion. What’s wrong with commissioning a painting or sculpture for the garden? I did that for my mother’s 41st birthday, and she loved it just fine. -It might surprise you to know that I actually played video games in my innocent childhood. Super Mario World for the Super Nintendo was the first and only video game I ever owned. I had bought it at the time because I thought having the latest electronic game would win me admiration from my peers. Imagine the ire of my five-year-old self when, to my horror, all the other children at the club also bought the same game. I never bought or played another video game. But you know, I do enjoy my Mario. Tad: I was quite scared when we came upon this storefront for the restaurant. I rarely venture out of Manhattan for food, and I daresay, this view was quite off putting. People say you can’t judge a book by its cover, but if that cover is worn and graffiti’d you can safely assume that it didn’t come from a gentleman’s library. I think this is what people mean when they talk about the “dangerous” neighborhoods in New York. Victor: Wait what? Tad, we’re in Bushwick. It’s like diet Williamsburg. Tad: Well, after wincing our way through the dive of a pizza parlor, we came to a more comfortable and elegant seating area. 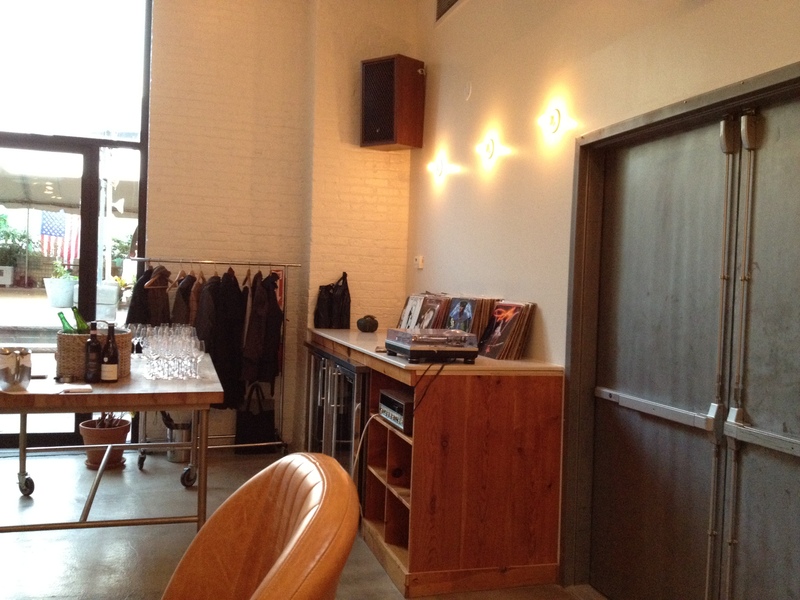 There was a vinyl player that played the music in the restaurant, and you could choose which vinyl discs to play! Only in Brooklyn hahaha. Tad: To be fair, sometimes vinyl is the only real alternative to box seats at the Met. My father owns a particularly stunning recording of Puccini’s Tosca. I looked for it but they didn’t have it. Victor: They started off the meal with some cider. It doesn’t really look like much, so I didn’t bother including the pic here. Tad: One thing I must mention was the graciousness of our host/sommelier, a striking woman of flawless charm. I wonder if she was willing to work at private events, as it would have been most excellent to have her greet guests at one of our small family get-togethers. Tad: Simple, almost too much so. 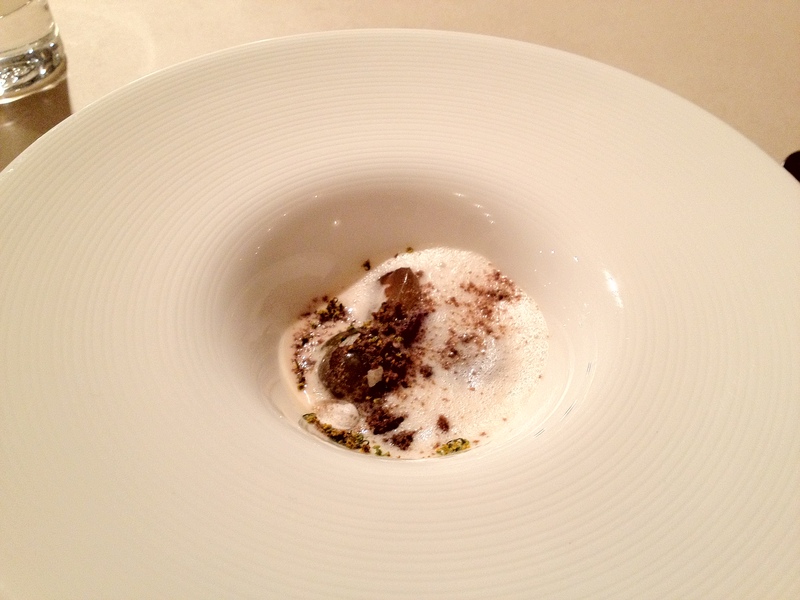 The Parsnip cream left an icy, crisp tartness that was quickly overwhelmed by the caviar. 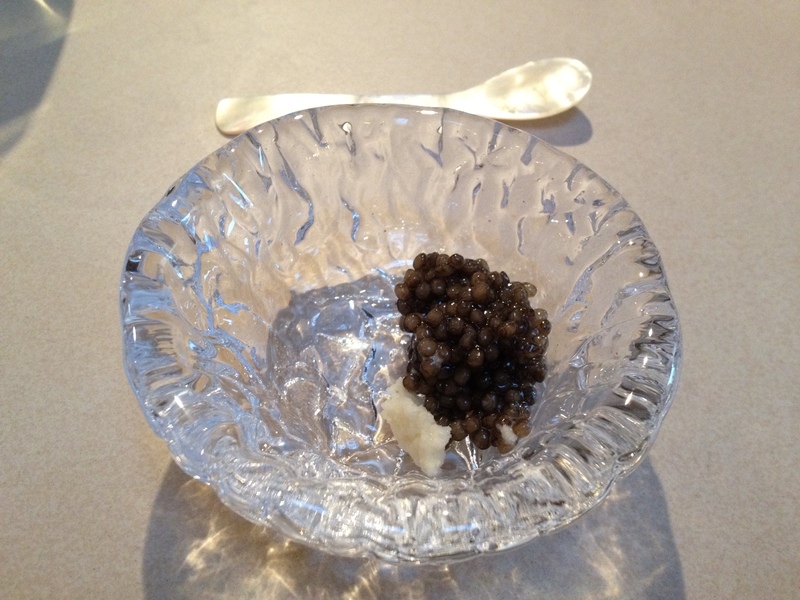 Didn’t seem that different from when you usually pop open some caviar to watch a movie at home. 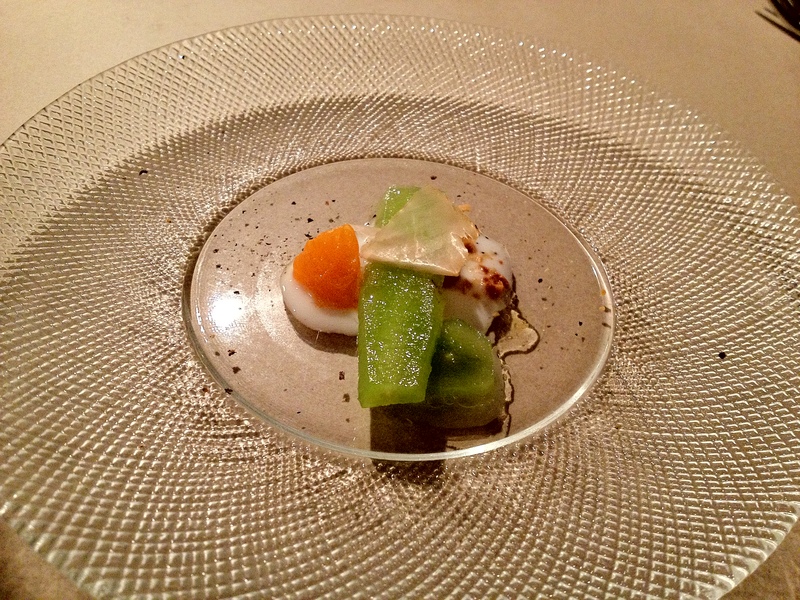 Tad: The star of this dish was the shrimp, but it played nicely with the seeds and the sauce. While it was almost as simple as the previous dish, each element had enough of a bold flavor profile that the resulting combination seemed much more complex. Tad: A very savory morsel that was almost ruined by an almost bitterness from one of the greens. It was hard to tell which one because they were both eaten in the same mouthful. Reminds me of that summer in the Hamptons, when we ate delicious seafood everyday, but Georgina Spottswood refused to go steady with me. Victor: The yogurt tasted weird (in a good way), like celery or a vegetable. It helped make the uni not as rich! 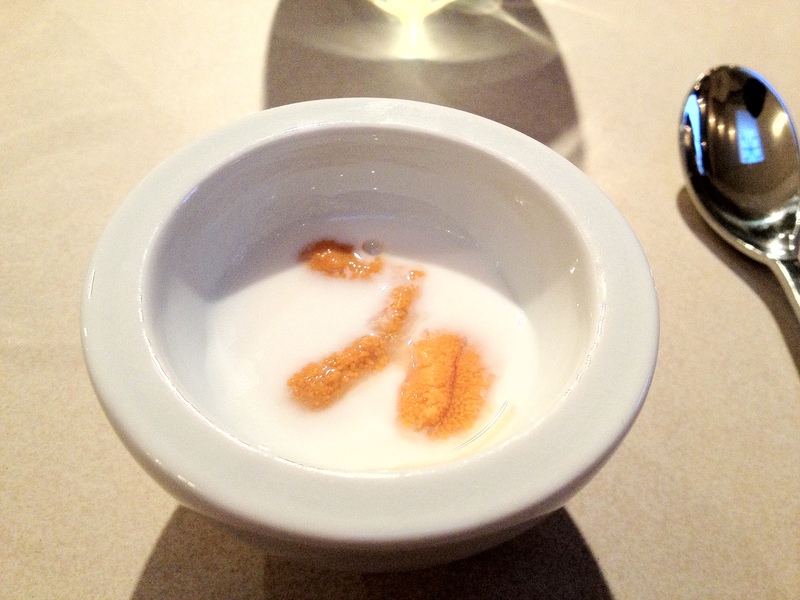 Tad: Sweet uni and savory yogurt. As Victor said, the yogurt was almost like a cold vegetable soup. Masterful dish, superb in balance. 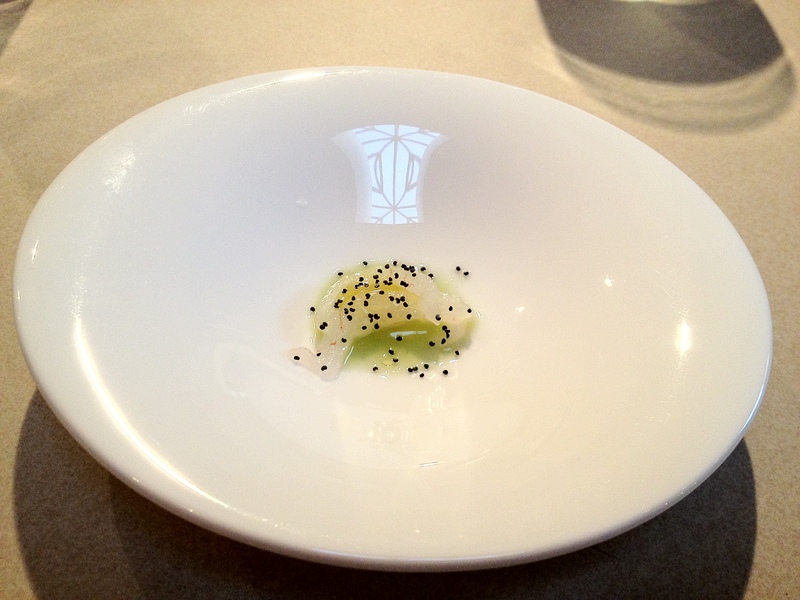 Tad: The experience was as follows: crisp, delicious shell augmented by a lime and herb saltiness. Then, pungent richness. Is there nothing that unites humanity, the rich and the poor, the great and the humble, the yuppie and the hippie, more than deep fried animal parts? Victor: This was one of my favorite courses! 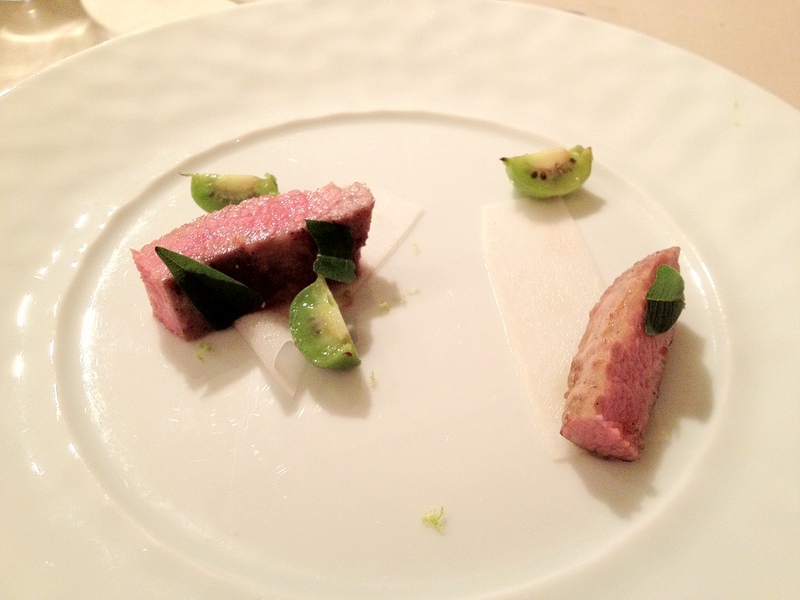 The sea perch was fresh and delicious, but the tuna stole the show for me. It was really fresh, and there was just the right amount of Maldon salt; it helped complement the tuna without changing it too much. 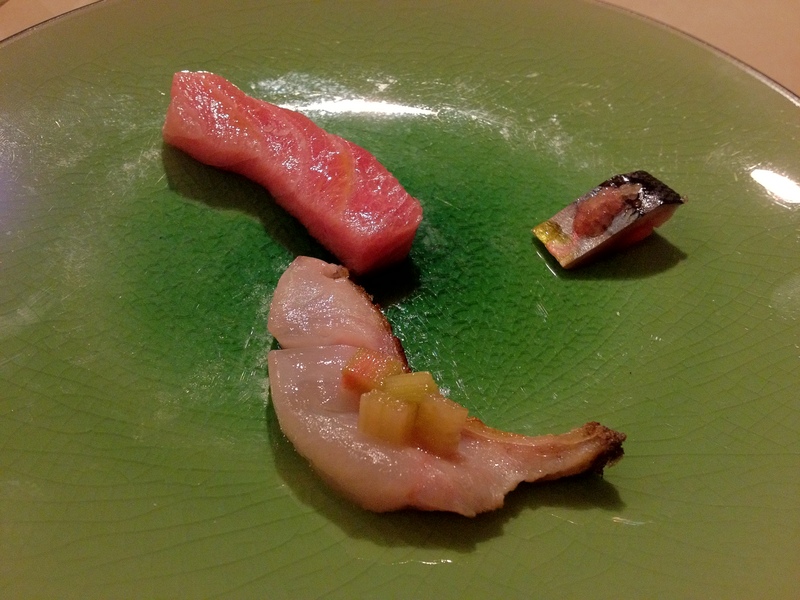 Unfortunately, the pike mackerel was forgettable :(. Tad: Delicious. I actually liked the sea perch more. The toro is a primadonna, regaled by praise and loved by all, basking comfortably in her own deliciousness. But the humble perch, young ingenue dressed in her best gown of rhubarb for her first moment in the spotlight, truly surprised me. I suppose that would make the mackerel the serving girl: dressed in lime and as presentable as you can make her. 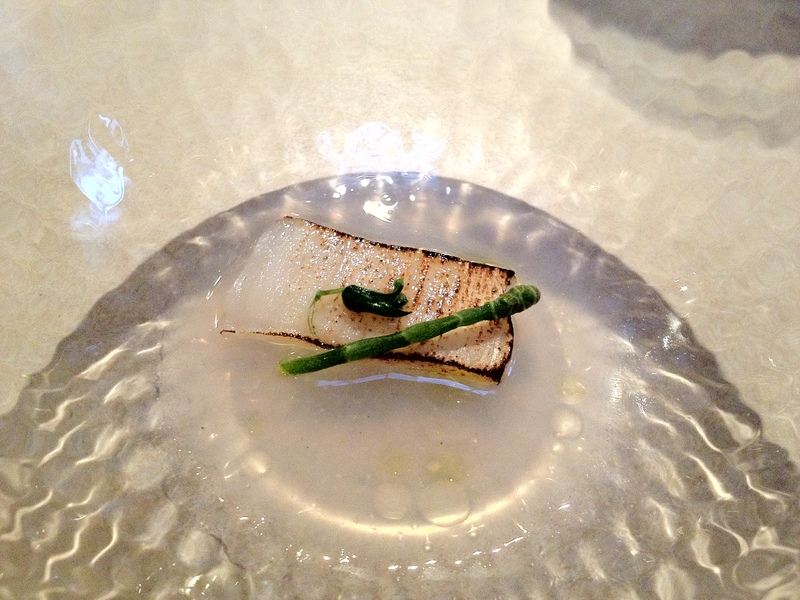 Victor: This dish wasn’t bad, but it felt a bit forgettable; the fact that it followed the sea perch dish only made it taste worse in our mouths hahaha. Tad: We ate this? I totally forgot (golf chuckle). 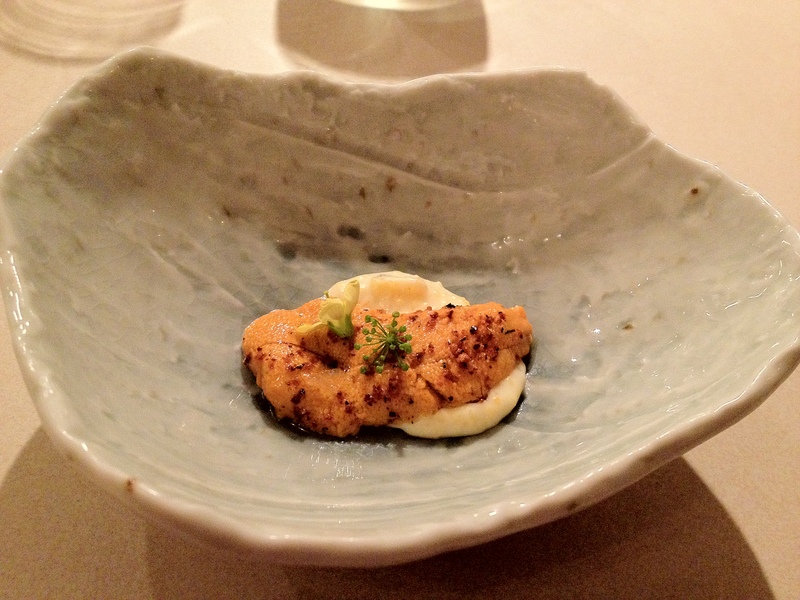 Victor: This felt like a polenta dish and not an uni dish, though the uni definitely complemented the dish by adding sweetness. 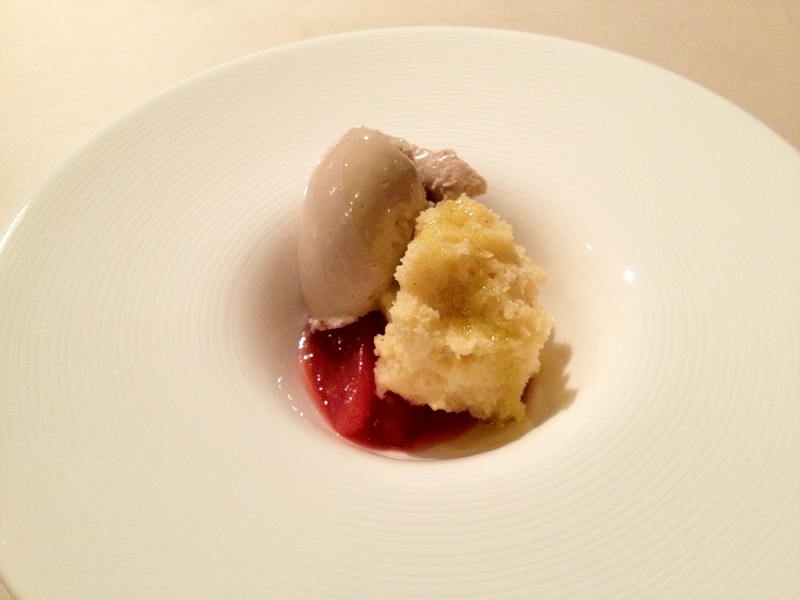 Tad: The fantastic texture of this dish added to its characterization as a polenta dish. Creamy and a bit gritty at the same time. The flowers were also incredibly fragrant. Not a single element was wasted in this dish. 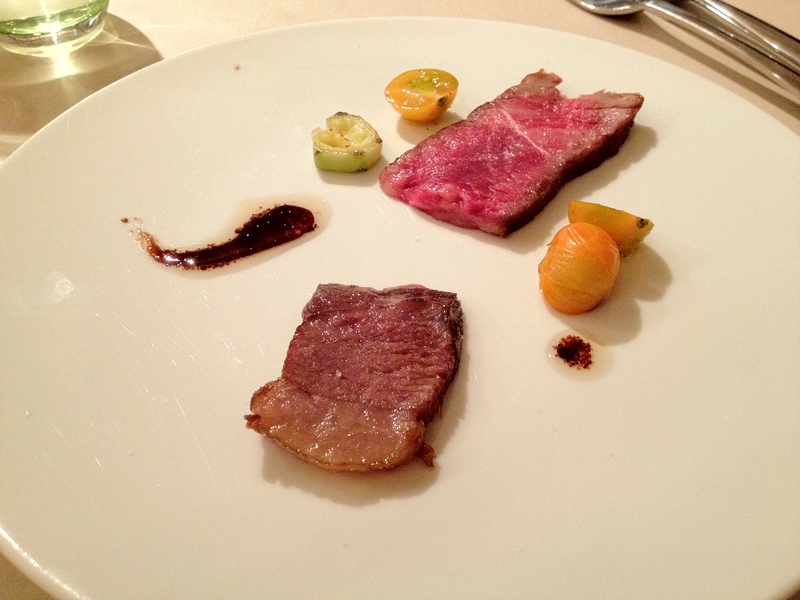 Victor: Chef Mirarchi took it out and grilled it (to get it evenly grilled) before putting it back in. The oyster was REALLY GOOD; it had just the right amount of coriander. Tad: This was another highlight of the evening. The oyster was infused with a smokey flavor all around its body because of the two step cooking process. 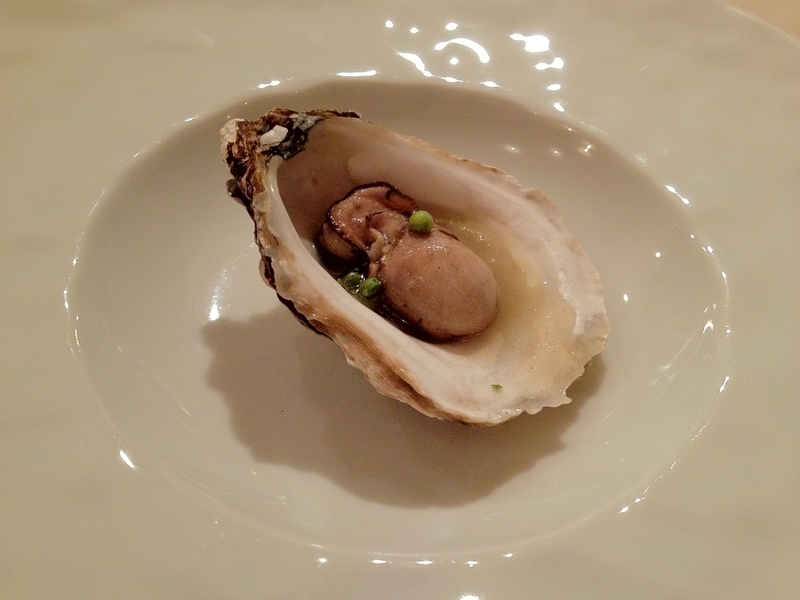 The flavor was very mild, complementing the delicate texture of the oyster. But, the coriander added a slight kick of intense flavor. Like a red silk handkerchief in the breast pocket of a black bespoke suit. 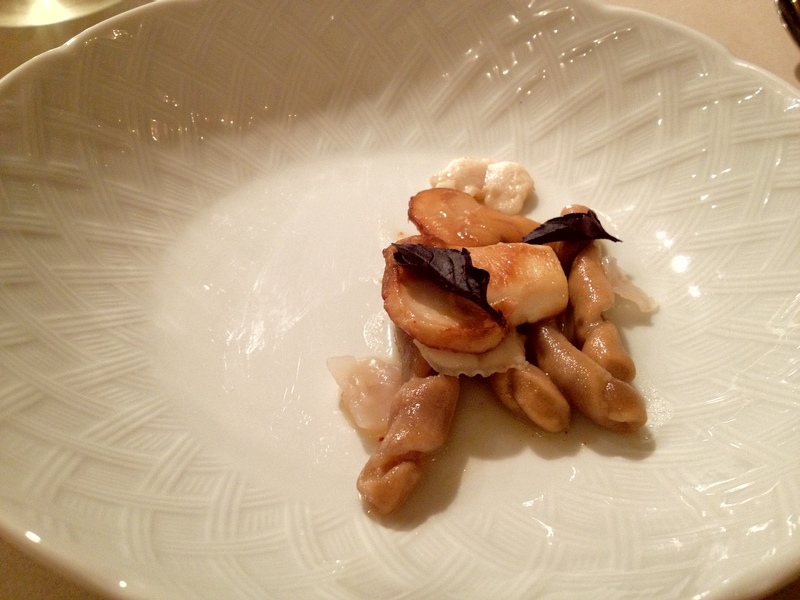 Victor: This was one of my favorite squid dishes ever. 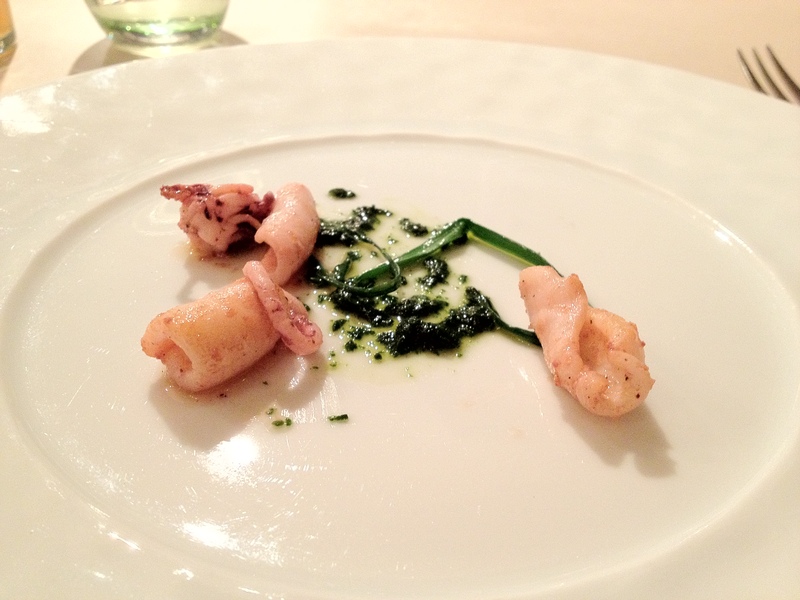 The squid was soft and chewy, but the sauce stole the show; the herbs were DELICIOUS. The aftertaste lingered in your mouth… in a good way. Tad: The herbs could make anything taste good. Even a simple fish filet. Or chicken breast. Or steak. The finish is almost chive-y, but not as vulgar. Victor: This was one of my favorite courses. It was DELICIOUS. Wrapping the beef around the puffball mushroom and having the egg yolk all around was soooooooooo goooooood. Tad: Was there any doubt that Mario would make a spectacular mushroom dish? Rich and delicious, but the mushrooms stole the show. Victor: The pine nuts added some pleasant texture to this dish. The nuts were definitely essential; without them, it would’ve been a pretty boring dish. Tad: Very well made pasta. 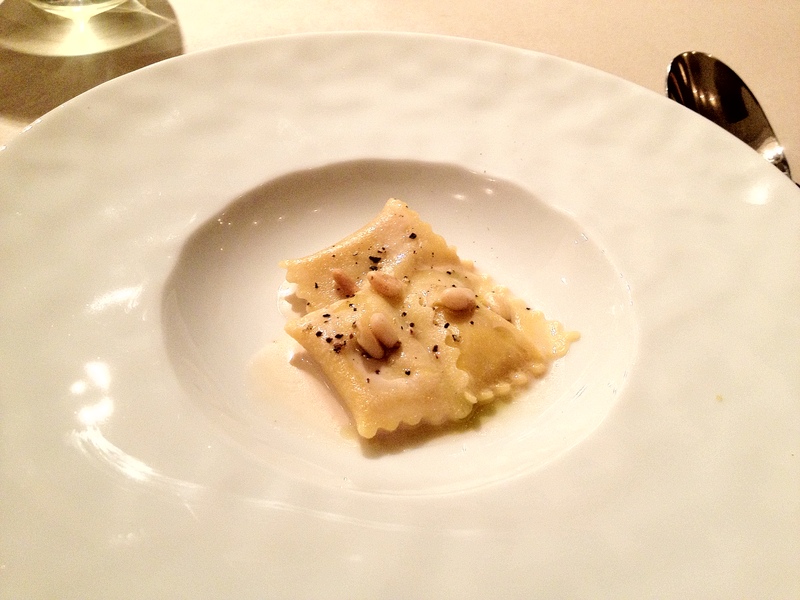 A bit salty for my tastes, but the pine nuts added some interesting complexity. Victor: The fusilli was very chewy, but I thought it could have been slightly softer. 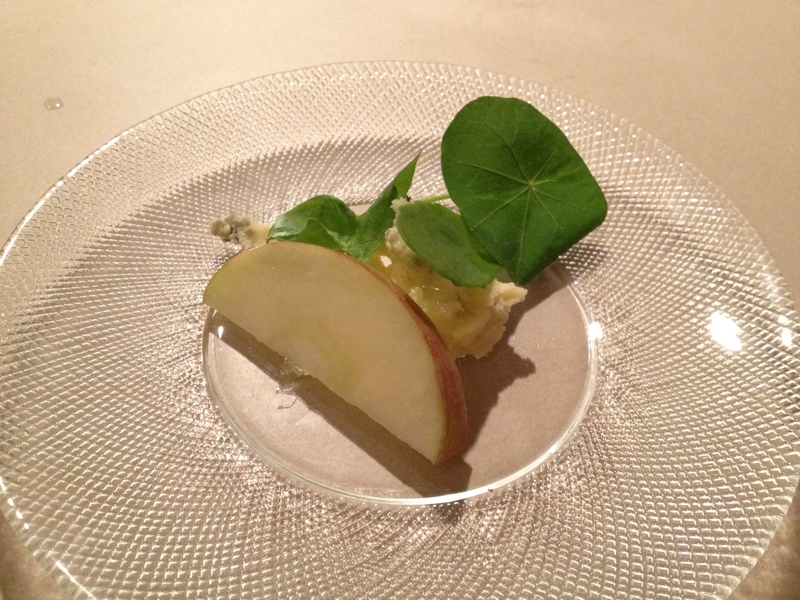 Overall, I thought the ingredients complemented each other well, both in terms of texture and taste. Tad: I could have gone without the fusilli. 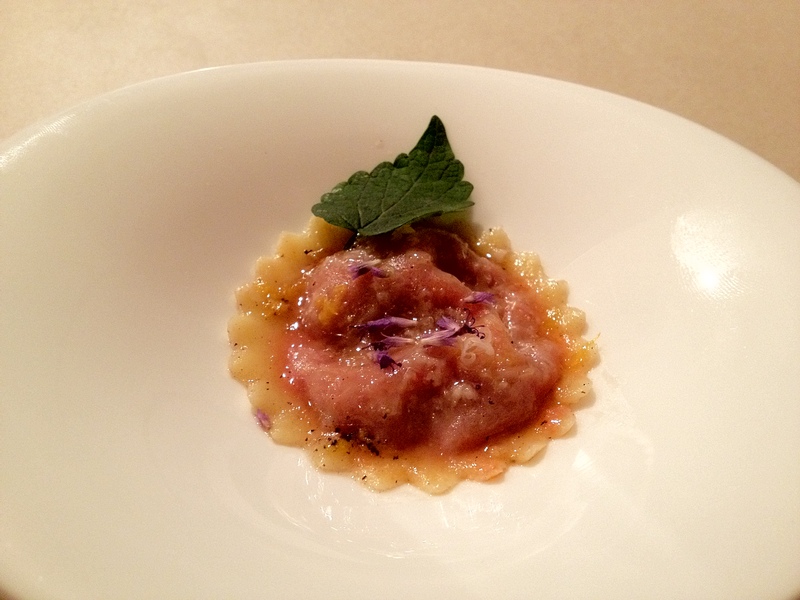 Despite Batali and Bastianich’s best efforts, it is still difficult for me to think of pasta as fine dining. Victor: There was an explosion of flavor from this (relatively) tiny piece. However, I found the sauce a little overpowering, and it lingered in the aftertaste in a bad way :(. Tad: There was a certain spice that definitely lingered. And there was so much sodium. Too much, my friends; even great gestural drawings require delicate touches. Also why more pasta? 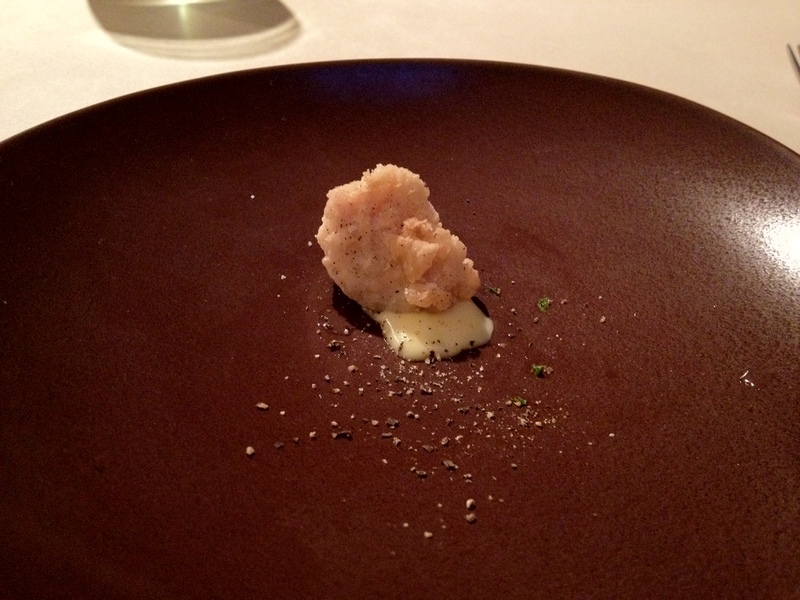 Tad: A very light Japanese dish after an assault of intense, heavy Italianate starch. It made me want something creamier. 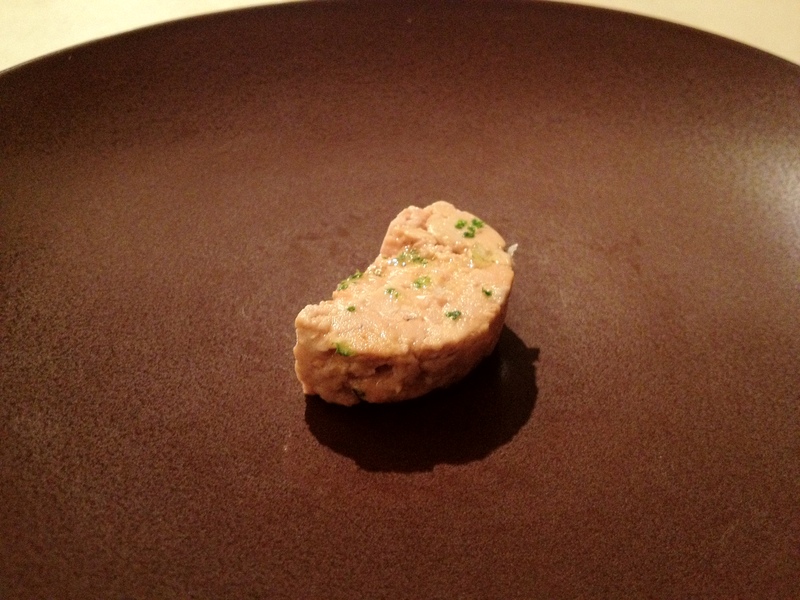 Like foie. Tad: Potatoes are well cooked. This is about as close as I will ever get to french fries. Victor: We had to get the meat out ourselves. 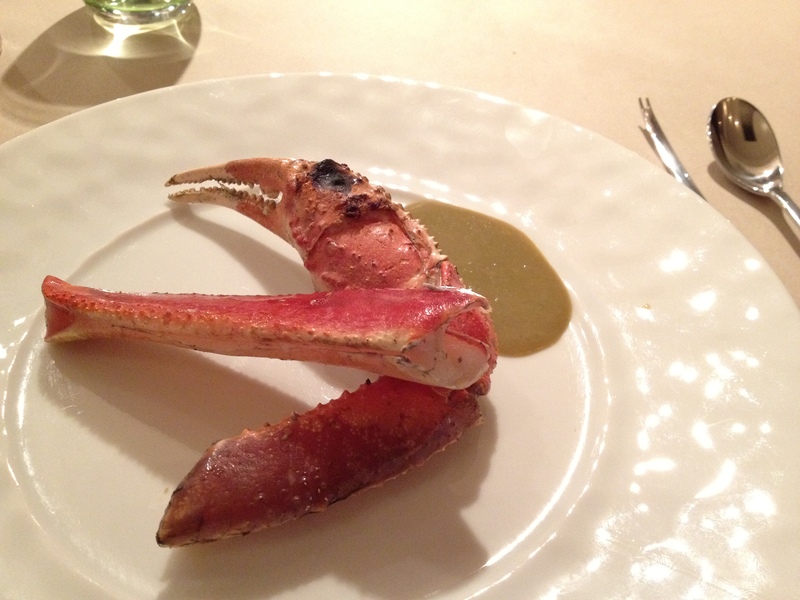 The sauce was very interesting (tasted just like those innards of crabs that most people don’t eat). The whole dish seemed very Asian to me, from the taste of the crab to our having to extract the meat out ourselves. Tad: I don’t know about tasting “Asian” (am I even allowed to say that and still be politically correct?) but the sauce was quite fishy. I was annoyed that I had to dig my own food. It made my fingers smell…unpleasant. Tad: Was this dessert? It tasted something like dessert. But yet it wasn’t. A palate cleanser, I suppose, but it was quite heavy for a palate cleanser. Tad: Like a lamb shank, elevated with the vegetables. The lamb itself was cooked well but not that intriguing. 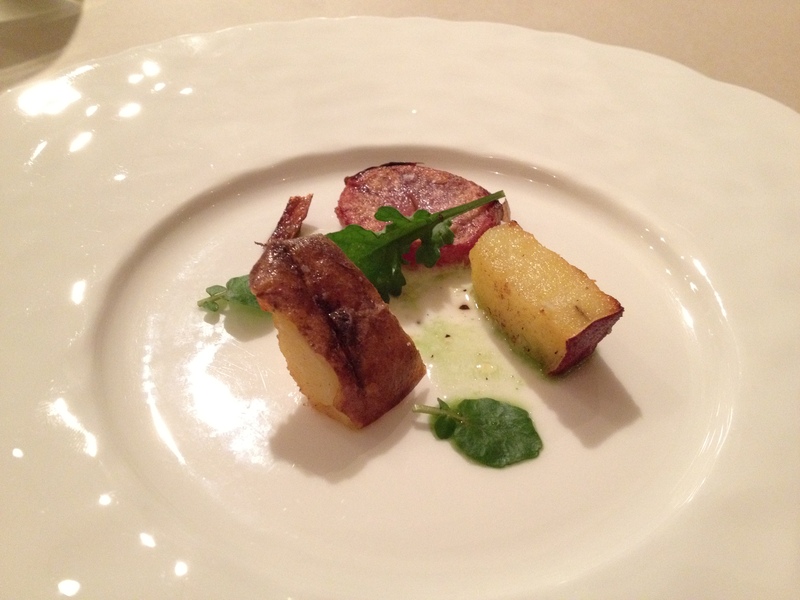 But, eating the elements together showed me a fairly complex interpretation of a lamb chop with mint jelly. 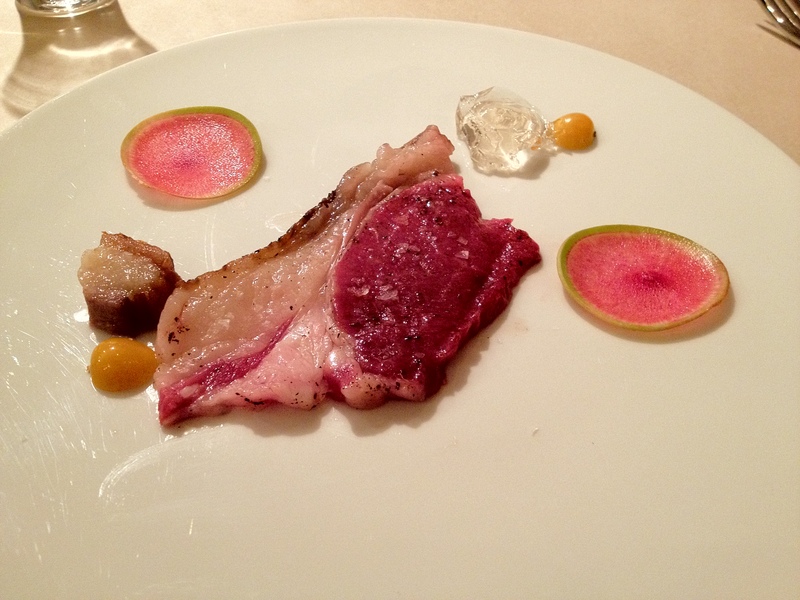 Especially notable was the tartness of the radish and subtle sweetness of the jelly. 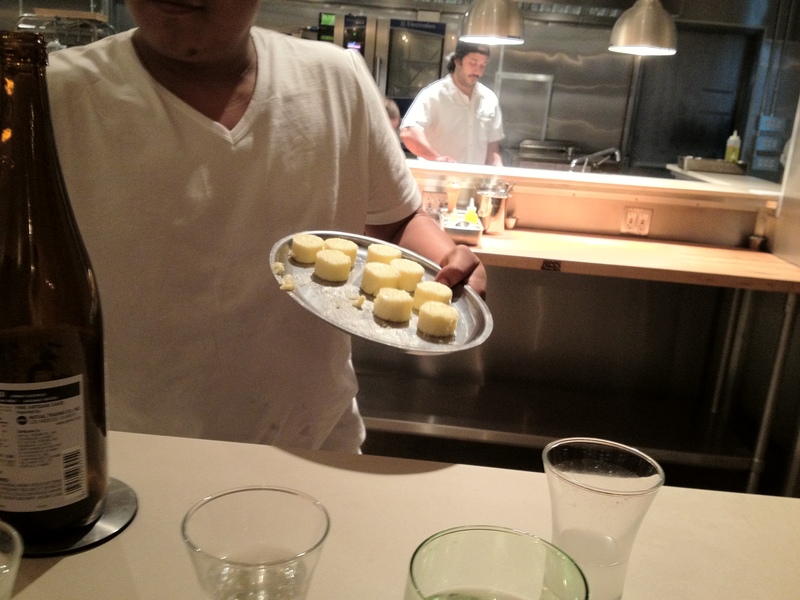 Victor: They had a plate of globs of butter. I felt like taking a pic of it… so I did. 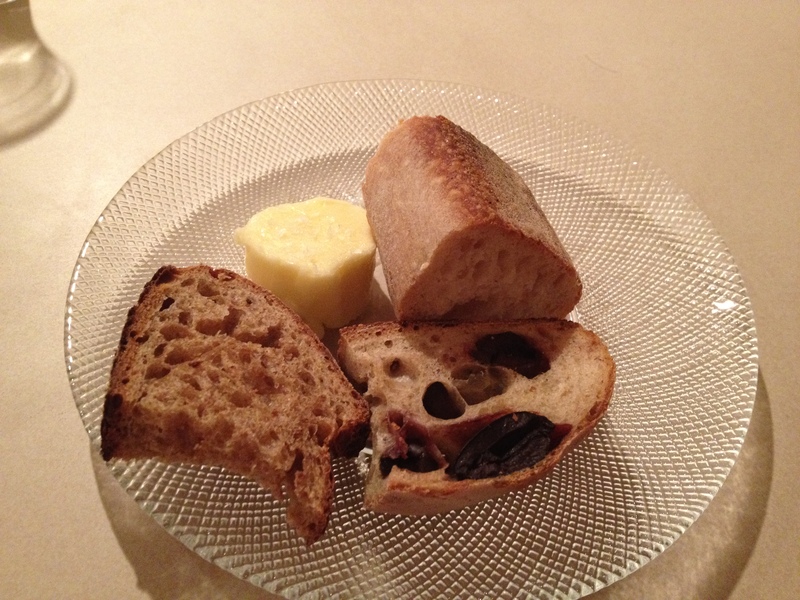 Tad: Why bread course now? The meal at this point started confusing me with its logic. Victor: Sadly, I didn’t think there was anything special about the bread. Tad: Very interesting preparation, and tasty. But the quality of the pork did most of the heavy lifting. You can see the marbling here. As my governess used to say, “any job worth doing is worth doing right.” This was cooked right. 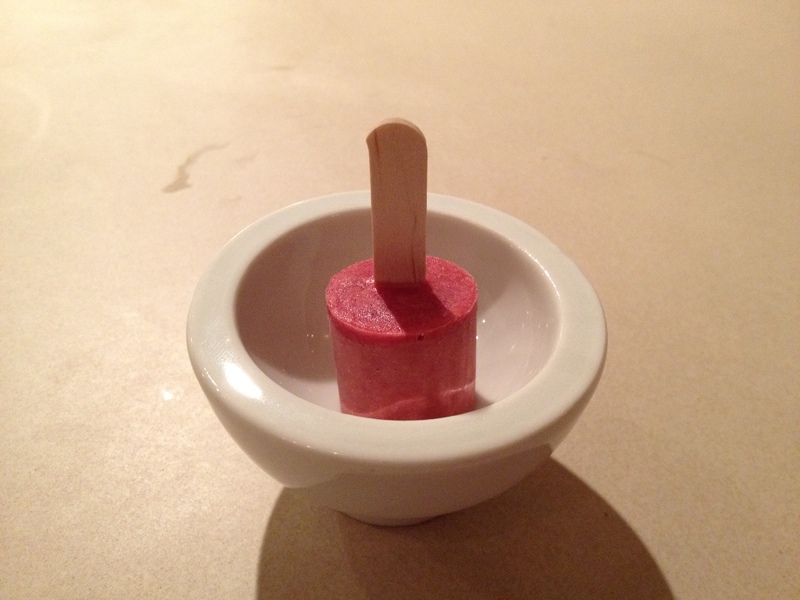 Tad: A popsicle. I prefer mine made with Dom. Cherry is fine, but champagne is divine. 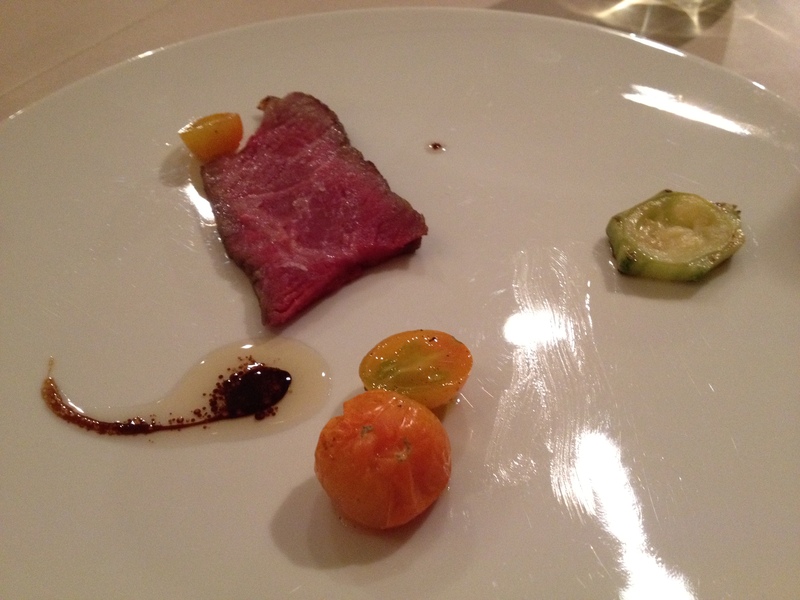 Victor: The beef was REALLY good, though I still think it wasn’t as good as beef I’ve had in a few other restaurants, like Eleven Madison Park or Per Se. Tad: One piece. Seriously. I was offended. The only thing that made it better was that I didn’t really like the beef that much anyway. But seriously? Seriously!? Is there an additional charge to get a full beef portion? I am happy to pay it. Victor: The honey aspect of this dish made the bleu cheese bearable for me hahaha. Tad: Very pungent bleu, and a typical presentation. I was still fuming from being robbed of my beef. 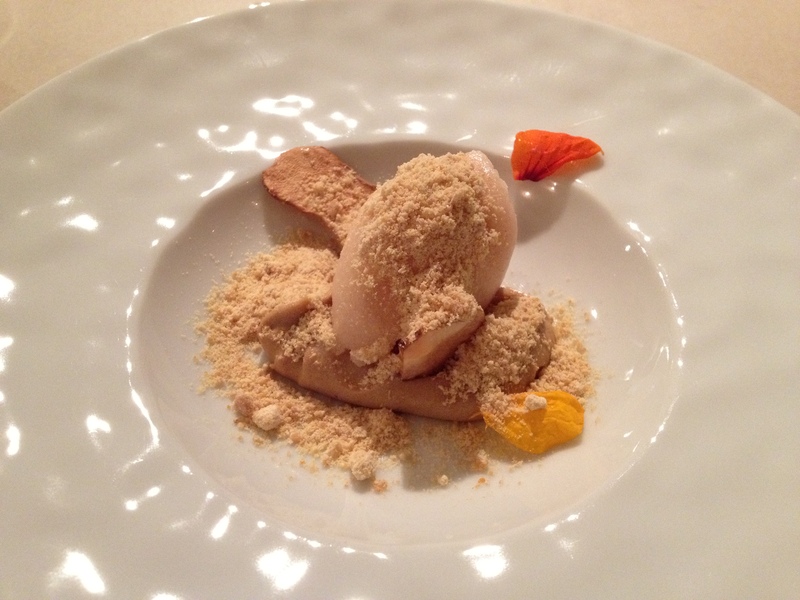 Victor: I really liked this dessert; Tad described it as a “savory dessert”. The gelato was sweet but also a little bitter, and it mixed really well with the sake pound cake. Texture- and taste-wise, all the ingredients fit together really well. I found myself alternating between bites of gelato and pound cake, enjoying each individually and then enjoying them combined. 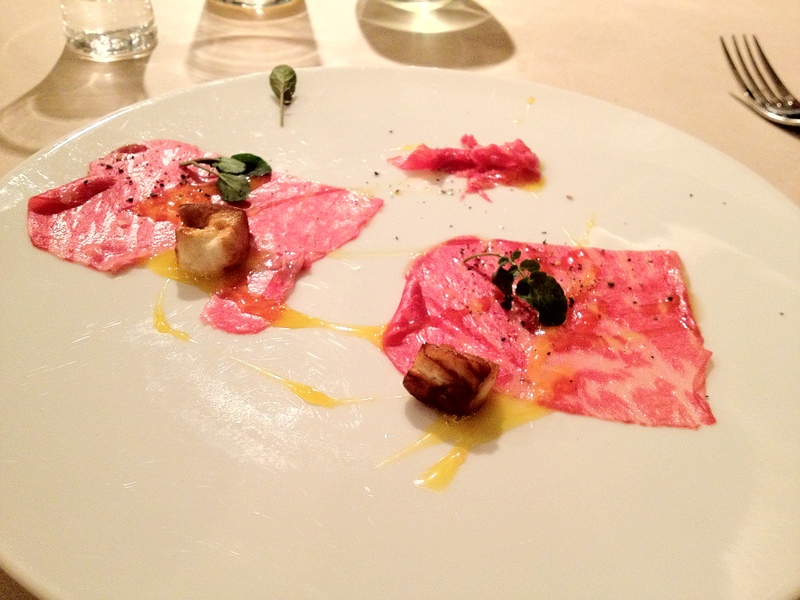 Victor: This might have been my favorite dish from a pure foodie standpoint. It wasn’t the most delicious dish; however, it was really creative, and it must have been really hard to pull off something as weird as this. The soup reminded me a little of the taste of wheatgrass, but it didn’t quite reach that level yet (It would have been horrible if it did haha.). There was a very thin line between success and failure in this dish, and the pastry chef somehow made it work. Kudos to her! Tad: Delicate balance indeed. I didn’t quite get wheatgrass though. 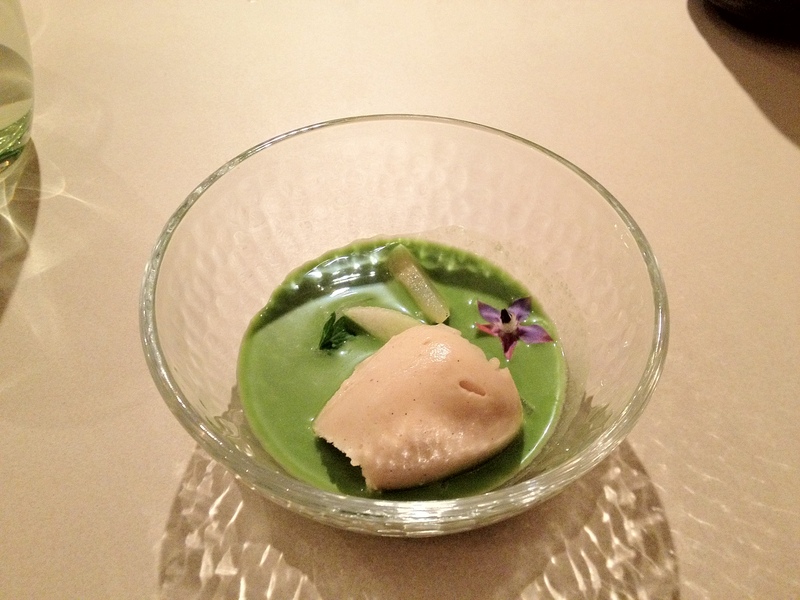 The soup was more herby than grassy for me. Still excellent and very creative. Tad: Another tasty dessert, but more typically so this time. 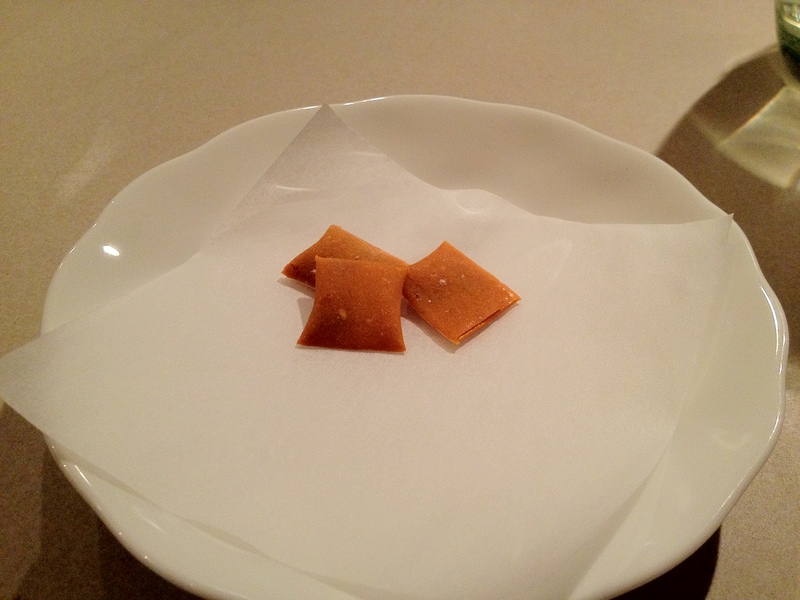 The brittle was quite good and quite necessary for this dish. Victor: Well, this was an ending that I haven’t had before. It was fun to eat, but I wasn’t particularly excited by it. Tad: I was taught never to chew gum, so I didn’t taste it.